Using the Ubuntu Enterprise Cloud and Ubuntu 9.10. If one is good, a dozen is better! Understand the game before you play. Know the facts before you switch! 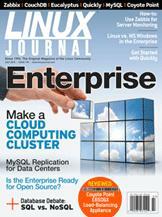 Making the case for Linux in your enterprise. Fast-track your next Python/GTK application. Scalable, enterprise-ready systems monitoring with Zabbix.